Original Editors - Megan Castagno from Bellarmine University's Pathophysiology of Complex Patient Problems project. Kawasaki disease, also known as mucocutaneous lymph node syndrome, is a medium-sized vessel vasculitis that affects children, especially of Japanese descent, usually between the ages of 1 and 8. In 20% of untreated patients, the coronary arteries can be affected by the vasculitis. The cardiac involvement can cause acute myocarditis with heart failure, arrhythmias, pericarditis, endocarditis, and sometimes coronary artery aneurysms. Acquired heart disease in children is predominantly caused by this disease. Other areas of the body affected by the inflammation are the kidneys, biliary tract, upper respiratory tract, and pancreas. Only 2% of patients will have a reoccurrence, which will usually occur months to years later. The prognosis is generally good for patient’s who are able to get treatment early enough, although there is the possibility of serious cardiovascular problems developing later on in life. For those who develop a large aneurysm (diameter larger than 8 mm) have the worst prognosis, as those will probably not regress or resolve. In some patients, severe ischemic heart disease can arise, which may necessitate a heart transplant. Kawasaki Disease can be found in any ethnic group, but is predominately found in the Asian population, more specifically the Japanese. Japanese children under the age of 5 are 10 times more likely to get Kawasaki Disease than Caucasian children of the same age group. The incidence of this disease in Hispanic and African American children falls in the middle. Males are 1.5 times more likely to get Kawasaki Disease than females. In the United States, there are approximately 4,000 diagnosed cases each year. Eighty percent of the cases of Kawasaki Disease are found in children under the age of 5. The most prevalent age group is 18-24 months, and it is rare under the age of 4 months. Kawasaki Disease begins with a fever that lasts for at least 5 days. Along with the fever the child may display irritability, intermittent fatigue, and occasional colicky abdominal aching. During the acute stage, which occurs during the first 2 weeks after onset, there is inflammation of the vascular system and the immune system has been activated. During this time, the arterioles, venules, and capillaries are affected. Later on in the disease the main coronary arteries, the heart, and the larger veins will be affected. Also during the acute phase, there are circulating antibodies that are cytotoxic to vascular endothelial cells, and the anticardiac myosin autoantibodies may be elevated. The elevation of the anticardiac myosin autoantibodies may be responsible for the myocardial damage that occurs. One to 2 days after the start of the fever, bulbar conjunctiva will appear bilaterally, without exudate. About 5 days after the onset of the fever, a polymorphous, erythematous macular rash appears most commonly over the trunk, but is typically concentrated in the perineal area. At this point the mouth is characterized as having a reddened tongue, dry, cracked, and fissured lips, and infected pharynx. Between the 3rd and 5th day, the palms of the hands and soles of the feet will begin to show red-purple discoloration and be slightly edematous. Pallor of the proximal parts of the fingernails and/or toenails may appear within 7 days after the start of Kawasaki Disease. On the 10th day, desquamation of the palmar, plantar, perineal, and periungual regions will be present. Sometimes the skin will flake off in large pieces, and the skin underneath will appear normal. In half of the patients affected by Kawasaki Disease, swollen and tender cervical lymph nodes will be present. Other findings present with this disease are arthalgias, urethritis, aseptic meningitis, hepatitis, vomiting, diarrhea, otitis, and hydrops of the gall bladder, and anterior uveitis. Cardiac complications usually begin about 1-4 weeks after the onset of the initial symptoms. that are not treated within 10 days of the onset of the fever. Currently there are no associated comorbidities with Kawasaki Disease, but there are possible risks that can develop after having the disease. Twenty percent of cases will go on to develop cardiac complications, while there is also a small risk of developing Reye's Syndrome. The IVIG is used to control the involvement of the coronary arteries, while the high-dose aspirin is used to lower the child’s fever, control the inflammation happening throughout the body, and also to decrease the chance of developing coronary artery abnormalities. For children with large coronary artery abnormalities other anticoagulant therapy will be needed, such as warfarin or dipyridamole. The diagnosis of Kawasaki Disease is made based off the clinical signs and symptoms of the patient, laboratory tests, a serial ECG and echocardiogram. There are no specific laboratory tests used to diagnose Kawasaki Disease, but they tend to check the child’s complete blood count (CBC), erythrocyte sedimentation rate (ESR), antinuclear antibody (ANA), rheumatoid factor (RF), and take throat and blood cultures. These laboratory tests are done mainly to exclude other diseases. The ECG and echocardiogram are done to allow the doctors to establish a baseline, and screen the patient’s myocardial and coronary artery status. Leukocytosis, an increase in immature white blood cells, is commonly found acutely. Also found in the laboratory tests can be mild normocytic anemia, thrombocytosis, elevated ESR or C-reactive protein. When other organ systems are involved, they may find sterile pyuria, elevated liver enzymes, cerebrospinal fluid pleocytosis, and proteinuria. The cause of this disease is currently unknown, but due to seasonal and geographic outbreaks, there is thought to be an infectious etiology. The infectious cause is thought to be an immunologic reaction to an “infectious, toxic, or antigenic substance”. It is proposed that a genetically predisposed child comes in contact with an infection or has an abnormal immunologic response to an infection, and that combination causes Kawasaki Disease. For more information, refer to the “characteristics/clinical presentation” section. The coronary artery involvement can be controlled by the use of high-dose IV immune globulin (IVIG) along with high-dose aspirin therapy, which helps lower the fever, control the inflammation throughout the body, and decrease the occurrence of abnormalities of the coronary artery. As the child’s fever goes away or if it has reached day 14 of the disease, the dose of aspirin should be decreased. It is important to monitor the serum aspirin level, especially if the aspirin is taken for 14 days. 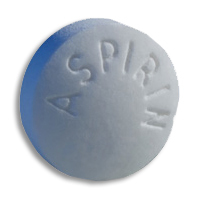 A smaller dosage of aspirin is typically continued for at least 8 weeks after the disease begins, but will usually be continued indefinitely for children with coronary artery abnormalities. For children with large coronary artery abnormalities other anticoagulant therapy will be needed, such as warfarin or dipyridamole. The IVIG therapy can cause a lower response rate to live viral vaccinations, so children who were treated with these medications should not receive any vaccinations for at least 11 months. It is also recommended that children on aspirin therapy receive the yearly influenza vaccination, as there is a small risk of the child developing Reye’s Syndrome due to the aspirin therapy. Kawasaki Disease is managed medically and there is no known physical therapy management, but it is possible that a child may come to physical therapy with complaints of joint pain, which is a possible symptom of the disease. It is important for physical therapists to recognize the symptoms of Kawasaki Disease so they are able to refer out when necessary. ↑ 1.00 1.01 1.02 1.03 1.04 1.05 1.06 1.07 1.08 1.09 1.10 1.11 1.12 Goodman CC, Fuller KS. Pathology: implications for the physical therapist. 3rd ed. St. Louis: Saunders Elsevier, 2009. ↑ 2.00 2.01 2.02 2.03 2.04 2.05 2.06 2.07 2.08 2.09 2.10 2.11 2.12 The Merck Manuals Online Medical Library. Kawasaki Disease. http://www.merckmanuals.com/professional/sec19/ch286/ch286d.html (accessed 15 March 2011). ↑ Kawasaki Disease Foundation. Kawasaki Disease: A Parent’s Guide. http://www.youtube.com/results?search_query=kawasaki+disease&aq=0 (accessed on 3 April 2011). ↑ Children’s Hospital Boston. Kawasaki Disease. http://www.childrenshospital.org/clinicalservices/Site468/mainpageS468P5.html (accessed 16 March 2011). ↑ Freebase. Kawasaki Disease. http://www.freebase.com/view/en/kawasaki_disease (accessed 3 April 2011). ↑ News Hawker: A Latest News Guide. http://www.newshawker.com/kawasaki-disease/article-7039 (accessed 3 April 2011). ↑ Associated Post. Kawasaki Disease Cure. http://apusa.us/kawasaki-disease-cure-12688/ (accessed 3 April 2011). ↑ Health. Kawasaki Disease. : An Unrecognised Killer. http://archives.chennaionline.com/health/homearticles/2003/07july15.asp (accessed 3 April 2011). ↑ Discovery Fit and Health. How Aspirin Works. http://health.howstuffworks.com/medicine/medication/aspirin.htm (accessed 3 April 2011). ↑ Drug 3K: Prescription Drug Information for Consumers. Gammer-P I.v. http://www.drug3k.com/drug/gammar-P-I-v-15123.htm (accessed 3 April 2011). ↑ 12.0 12.1 The American Academy of Family Physicians. Cardiovascular Medicine: Kawasaki Disease. http://www.aafp.org/afp/990600ap/3093.html (accessed 15 March 2011). ↑ Pediatric Care Online. 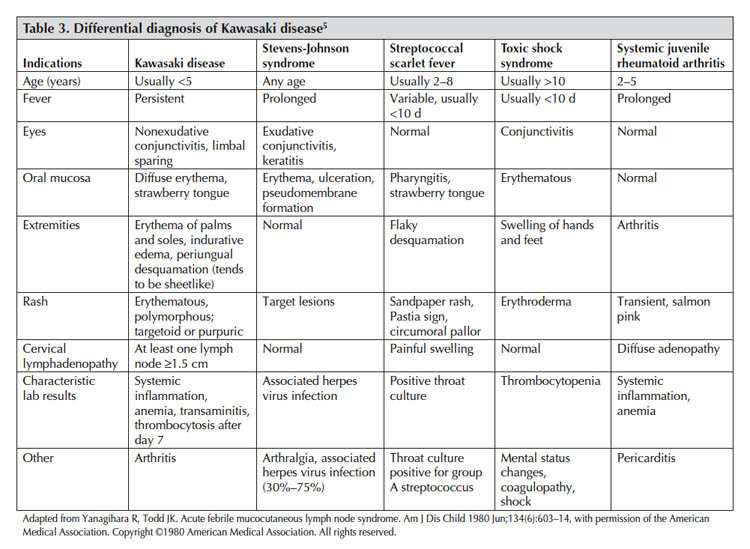 Kawasaki Disease Differential Diagnosis. 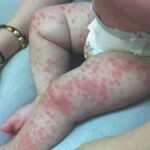 http://www.pediatriccareonline.org/pco/ub/view/Point-of-Care-Quick-Reference/397192/1.1/kawasaki_disease (accessed 15 March 2011). ↑ Mayo Clinic. Kawasaki Disease. http://www.mayoclinic.com/health/kawasaki-disease/DS00576 (accessed 15 March 2011). ↑ Cox JR, Sallis RE. Recognition of Kawasaki Disease. The Permanente Journal. 2009; 13(1).